Don't hesitate one more second, hurry and get the Cool RC drone today! 1. Avoid placing the batteries in the place with high temperatures and exposure to heat. 2. Non-rechargeable batteries are not to be recharged; different types of batteries or new and used batteries are not to be mixed. 3. Use dry and soft cloth to clean this product. Do not immerse this product in water, otherwise, the electronic parts will be damaged. Please be informed that there are two gift boxes in different sizes which are dispatched randomly. Please be aware that the products inside are the same. 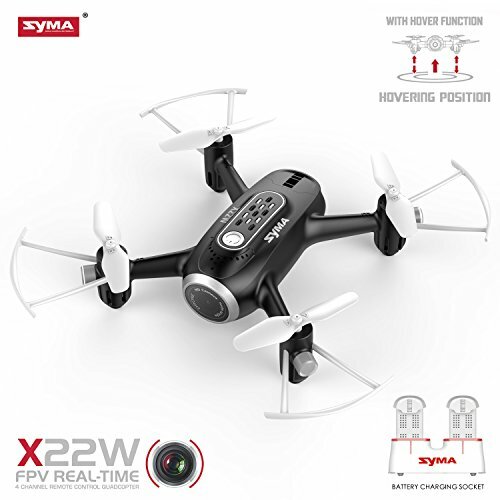 ➤【Flexible Flying& Easy Use】Utilizes the 4-axis structure, enabling the drone to be even more flexible, speedy. Support indoor flying/360° stunt flip /auto take-off and landing. ➤【Accurate Positioning】 Built-in 6-axis gyroscope stabilizer to ensure accurate positioning in flight. ➤【FPV Real-time Transmission】Enjoy all real-time video feed from your mobile device with all new FPV Wifi features. ➤【WIFI Camera Storage Function】The video automatically be stored in the document of the APP control interface, Headless function making it easy for directional control. ➤【APP Control】Control the drone with the smart phone. Can draw a route on the flight-track interface with your fingertips on the screen, the drone will fly in accordance with per given route.